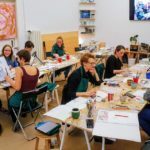 Located in the heart of Zurich, PaintLounge is a space for you to slow down and create something with your hands. We use this space for many of our regular guided painting events as well as open painting sessions. We will also bring you occasional specials such as shiatsu & paint and maybe also some easy yoga sessions. The studio is open once every two weeks for open painting sessions. Please check our calendar for an up-to-date list of all sessions. Drinks and snack, music & good vibes! Our open painting sessions are designed for slightly more independent painters. 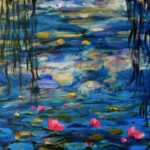 If you are a complete beginner we recommend you first try out one of our guided painting events. Nevertheless, even at our open painting sessions you are not on your own: one of our experienced painting hosts is always present for support and inspiration. For open painting sesssions there is no need to buy a ticket in advance but we encourage registrations via email (info@paintevents.ch) as they can help us plan. Especially if you are looking for a particular canvas size please check with us whether we have it in stock. We have space for about 14 painters and it’s first come – first serve. Canvases can be purchased directly at the studio and include the use of paint and brushes for one whole open painting session (up to 5 hours). Lower prices are available if you have your own paint or want to purchase a canvas to take home. We also don’t mind if you bring some or even all of your materials – in that case we simply charge a small fee for the use of our studio (incl. tea & coffe). Interested? Get in touch for availabilty at info@paintevents.ch or call us on 076 234 57 88.